The D-Day invasion of Normandy is remembered as an American triumph and the beginning of the end for Nazi Germany. On Saturday, June 7, 10:30 a.m. the Delaware Public Archives will commemorate the 70th anniversary of this pivotal day in American and World history with a special program at the Archives about the battle. This program will explore elements of the battle often left out of the narrative including the high level of risk and uncertainty faced by American officers and the sacrifices made by the troops on the blood-soaked beaches. How did these soldiers survive situations in which they had to sometimes offset the miscalculations of their superiors with their own raw courage? What was it like, on June 6, 1944, to ride the first troop transports onto the beaches, to land by parachute in the French countryside, or to have to wait in England to find out if the mission had succeeded or failed? Join the Delaware Public Archives for this program and find out. Categories: Delaware, WWII | Tags: D-Day, D-Day Anniversary, D-Day Anniversary Event, Delaware, Delaware Public Archives, Mid Atlantic Region, Mid Atlantic States, Mid Atlantic Travel | Permalink. Bedford, Virginia, the community who suffered the highest per capita D-Day losses and home of The National D-Day Memorial, will honor and remember D-Day veterans for the 70th Anniversary of D-Day. If you are unable to make the morning service, you can watch it live online on http://www.WDBJ7.com. The National D-Day Memorial is place where veterans gather, share stories, and reflect on the high cost of freedom. 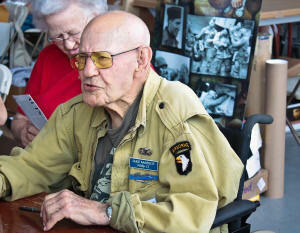 Visitors may have the opportunity to shake the hands of veterans, and listen to their stories. The Memorial will open at 7:30AM on Friday, June 6. Please see their website at http://www.dday.org for more information about satellite parking. The commemoration begins with a morning ceremony featuring the laying of wreaths by D-Day units. * Parachute jump by the Golden Knights. The public is invited to the Memorial for an outdoor movie night with a 1940s theme. The Canteen will offer the best of period refreshments and the featured film will be “Casablanca.” The film begins at dusk. There are a limited number of tickets available for pre-sale. Unless there is a threat of inclement weather, additional tickets will be sold for $30 at the door. Conclude the 70th anniversary observance with an authentic WWII field chapel ecumenical service. A unique and moving experience. The service begins at 11am. Visit http://www.dday.org to learn more. These events with the exclusion of the Tommy Dorsey Orchestra are free to the public. Donations are appreciated. The Memorial is supported by contributions to the National D-Day Memorial Foundation, a 501(c)(3) not-for profit organization; it is not a National Park and does receive federal funding. Categories: Virginia, WWII | Tags: Bedford, Bedford Boys, D-Day, D-Day Anniversary, D-Day Anniversary Event, Mid Atlantic Region, Mid Atlantic States, Mid Atlantic Travel, The National D-Day Memorial, Virginia | Permalink. This weekend marks the 70th anniversary of D-Day, or Operation Overlord, the invasion of Normandy. The Mid-Atlantic Air Museum offers an unparalleled way to commemorate the event by hosting their WWII Weekend. 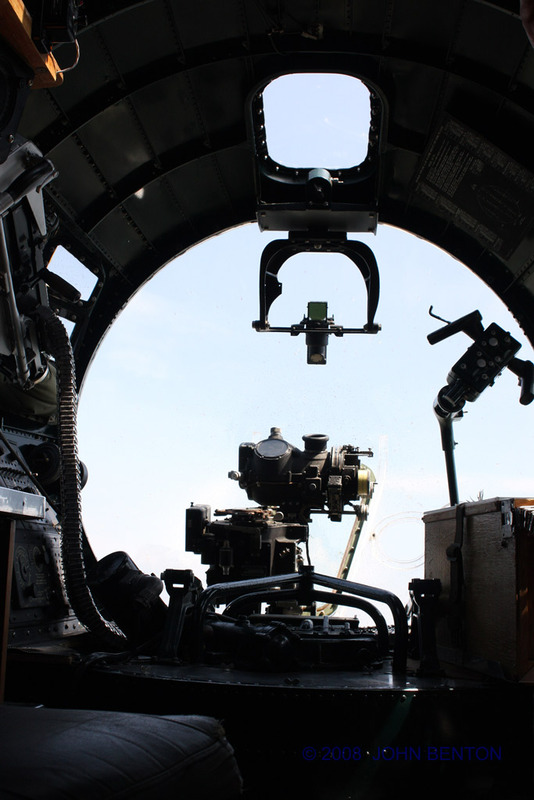 For three days, June 6, 7 & 8, the Mid-Atlantic Air Museum presents more than 1,700 living history re-enactors, dozens of vintage WW II aircraft, hundreds of military vehicles, and thousands of period artifacts. 1944 comes alive for show-goers who witness skirmishes and battles at the recreated airfield and wander the sprawling military camp. There will be 40’s era dancing, singing, comedy skits, live radio broadcasts and theater at the ‘Home Front’. One of the nation’s largest militaria flea markets in the nation, with more than 150 vendors, will spread along the taxiway. Most important of all, the story of the greatest conflict in human history will be told by those who were there. I attended the World War II Weekend several years ago, and was quite moved by the experience. You can read my travel features below. 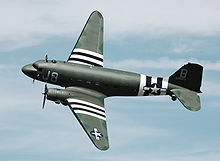 The first is my account of flying on a C-47, The Black Sparrow, with Mike Ingrisano of McLean, VA. Mike flew into France as a radioman in a C-47 on D-Day. The second story is my account of a Troop Carrier Command reunion held in DE in 2003, and gives the accounts of the C-47 flight crews. 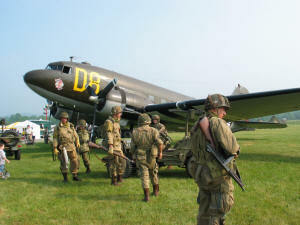 Categories: Pennsylvania, WWII | Tags: Adventure Travel, C-47, D-Day, D-Day Anniversary, D-Day Anniversary Event, D-Day Fly-IN, D-Day Re-enactment, Mid Atlantic Air Museum, Mid Atlantic Air Museum WWII Weekend, Mid Atlantic Region, Mid Atlantic States, Pennsylvania, Troop Carrier Command, Troop Carriers, World War II, World War II History, WWII | Permalink.